Last weekend (April 20-23, 2017), my friend Larry and I took a weekend tour around Mt. 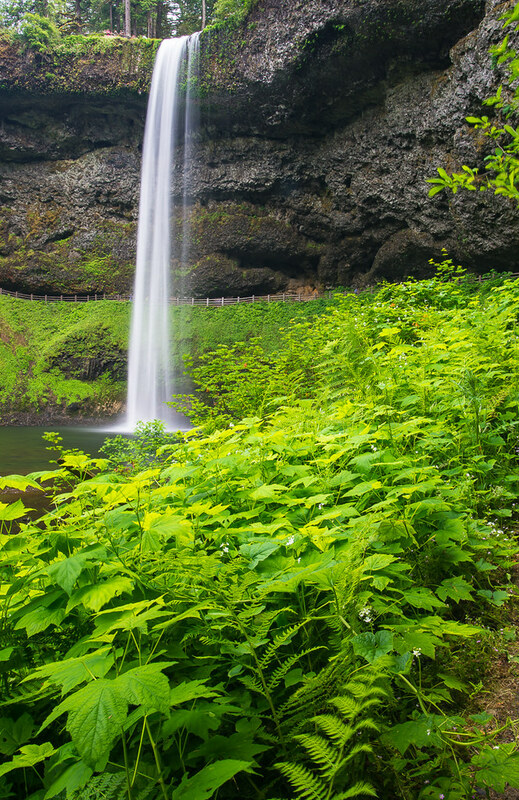 Hood and the Silver Falls State Park in Oregon. Here is a sampling of images and tips from the trip. You can view the high resolution images @ Flickr. We did about 750 miles of driving. Below is the map of our route. Instead of driving on I-5, we decided to drive clockwise via east Washington to Hood River thereby avoiding a few road construction spots. The first stop was at the famous red barn next to a pear orchard. The barn has been featured in a number of magazines and Oregon tour guide book covers. 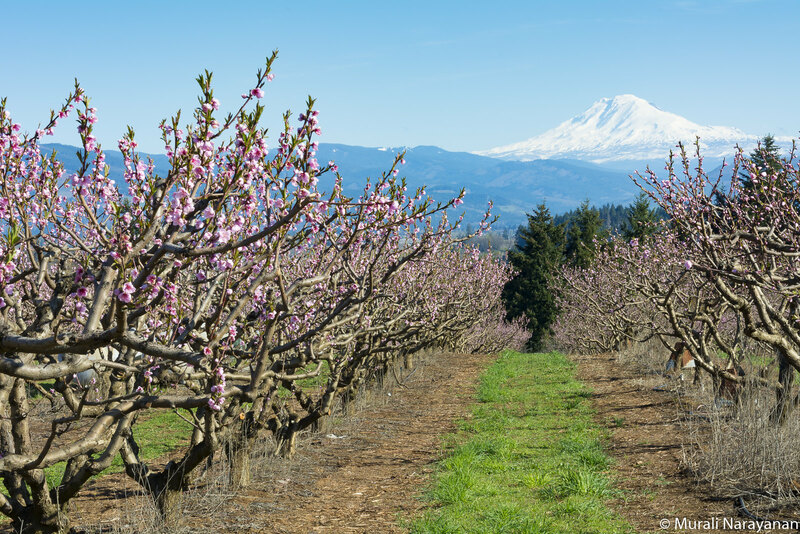 Early to mid April is the best time to photograph the barns when the pear blossoms are at their peak. The spot is quite good for both sunrise and sunset shots. Due to heavy cloud cover, we couldn’t see Mt. Hood. No sunset colors in the sky either. We decided to return next morning. It snowed a little when we reached Timberline Lodge and checked in. 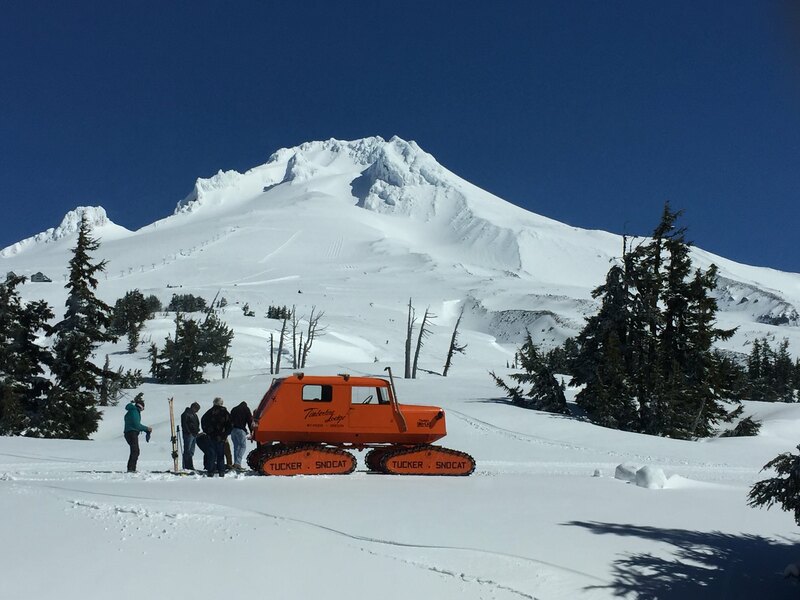 Built in 1937, the Lodge stands on the south slope of Mt Hood at an elevation of 6,000 feet. It is a popular place for skiers. You can ski here until Labor Day!!! Due to a convention, parking was a challenge. There are 7 retaurants in the Lodge but only 2 were open for dinner. We had a very relaxing dinner at the Ram’s Head Bar. The food and beer were terrific. The room was rather small but comfortable. Next morning, I tried to go behind the lodge to photograph sunrise but found out that the doors were locked. Later we found out that they don’t clear the snow at the back of the lodge until May. Over 50′ of snow were piled up. 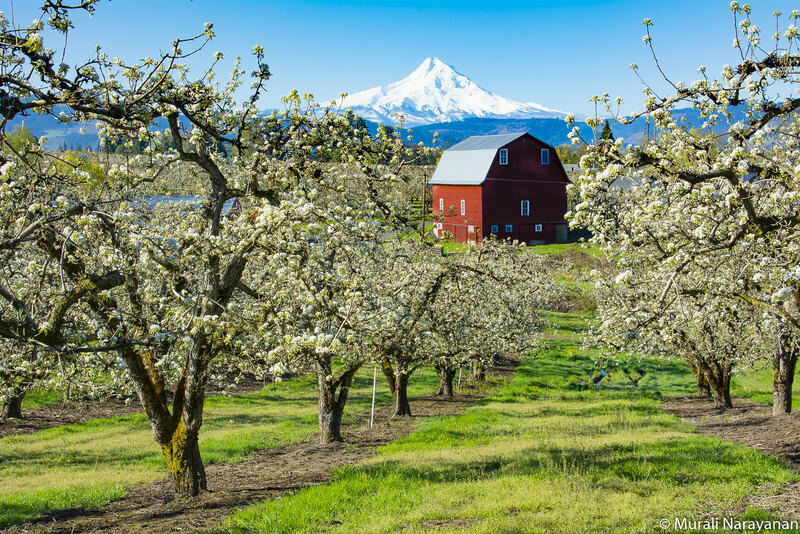 We decided to drive back to Hood river to photograph the red barn. This time no cloud was in sight anywhere. We grabbed some good shots. On our way back to the lodge, we stopped at 2 spots. The first was at the Packer Orchards. It was closed but we got a good shot of Mt. Adams with crabapple trees/blossoms in the foreground. The second stop was at the White River Sno Park. The light was turning harsh. Took a shot from the bridge over Snake river. We got back to the Lodge and headed to the Ram’s Head Bar for a superb mushroom soup. The best I have ever had. Period. The view from the table was also spectacular. Hundreds of people were skiing down Mt. Hood. After lunch, we checked out at noon and headed to the Silver Falls State Park and checked into the Lodge & Conference Center. We got one room in a 6-room cabin. The other 5 rooms were unoccupied and we had the living room to ourselves. Although the Lodge has no dining facilities, the setting is quiet and serene. 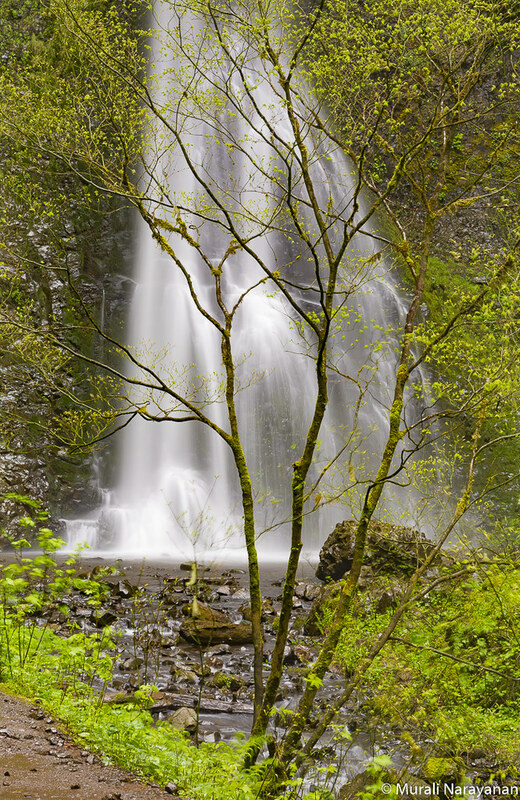 The park has 10 waterfalls within about 5 square miles with terrific trails. We unloaded our luggage and headed to the South Falls. 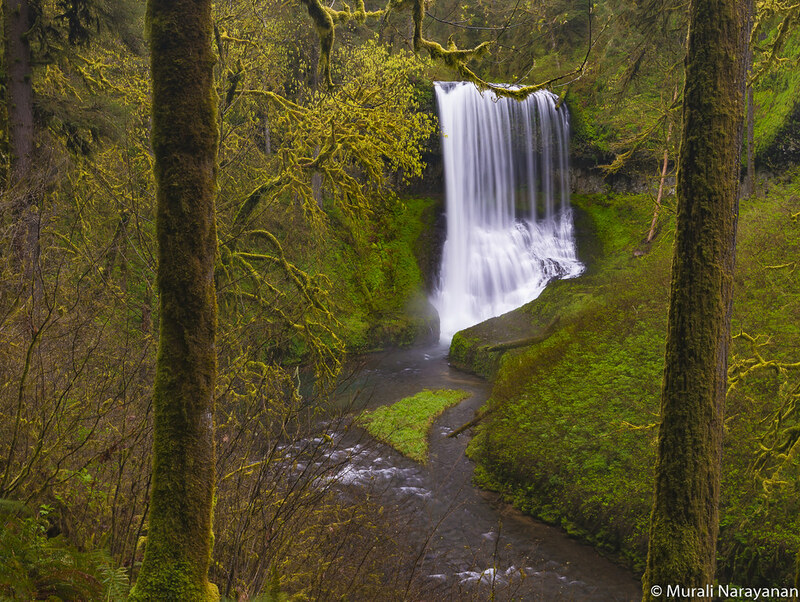 April is not a good time to photograph the South Falls as a number of plants were bare with no leaves. Here is a shot of South Falls from a previous trip in the summer. We then hiked 0.9 miles to the Lower South Falls. 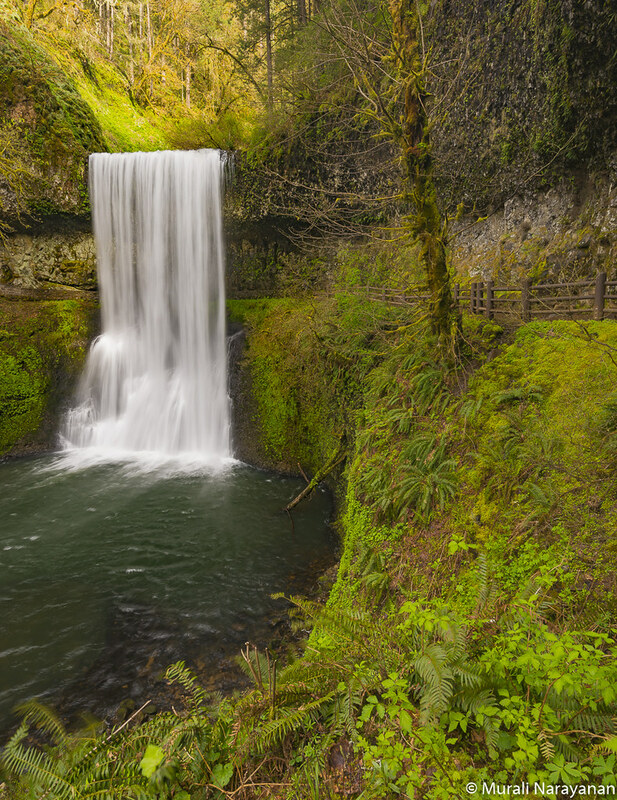 Although not as tall as the South Falls, Lower South Falls stream sheets out over a broad, uniform ledge of basalt rocks. The best view of the Falls is from the trail as it approaches the falls from upstream, shortly before passing behind the falls. Maple trees frame the falls and provide a great accent of color in late October and early November when the leaves are turning. We will definitely revisit the park in early November when the fall colors peak. Larry had grabbed some salads and sandwiches from Whole Foods in Bellevue and we consumed some of it for dinner along with a bottle of wine. Next morning, we got up early and drove to the Winter Falls Trailhead. There was only one car parked at the trailhead. It was drizzling we decided not to take our camera equipment and hike down to checkout 6 waterfalls along the WinterTrail (Winter Falls) and Canyon Trail (Twin Falls, Middle North Falls, Drake Falls, Double Falls and Lower North Falls). It took 2.5 hrs to all the falls and return to the car. The total hiking distance was 3 miles. It was all iphone photography that morning. As there were no restaurants in the vicinty of the park, we decided to go to drive 25 miles to Salem, OR for lunch. We located a terrific hole-in-the-wall Mexican joint . The food was authentic and awesome. After a heavy lunch, we returned to the Lodge after picking up Subway sandwiches for dinner. Larry decided to relax and I drove to the North Falls Parking lot to checkout both the North Falls and the Upper North Falls. It started drizzling. I first did the short hike to the Upper North Falls and grabbed a few shots. The drizzle turned into a downpour and I walked back to the car and waited for the rain to stop. 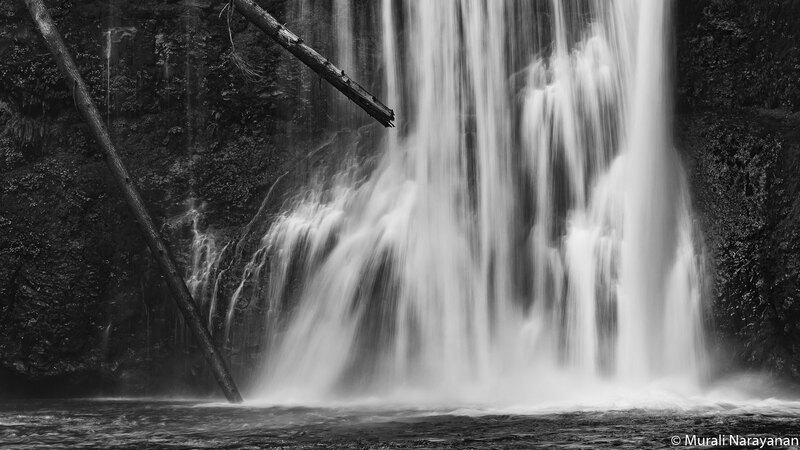 10 minutes later, it stopped raining and I hiked to the North Falls and captured a few shots. Both the falls face west and so unless it is a cloudy day, morning is a btter time to shoot them. The ideal time to visit the North Falls is in late October and early November when the autumn foliage downstream of the falls is outstanding. I was tired after 5 miles of hiking with about 20 lb of photo gear. Larry streamed Top Gun movie on the living room TV. I watched a bit of it and went to bed early. Sunday morning, we got up really early, took a shower and headed back to the Winter Falls trailhead to repeat the previous day hike. This time, we were the only ones on the trail and we spent 1.5 hrs photographeing the Middle North Falls and the Double Falls. 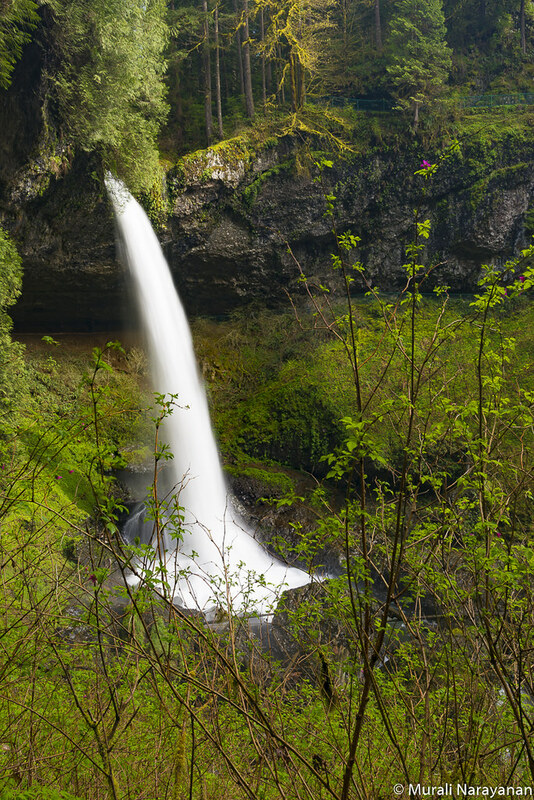 The best view of the Middle North Falls is from a cave, about 500 feet downstream from the spur leading behind the falls. You will need a wide angle lens. 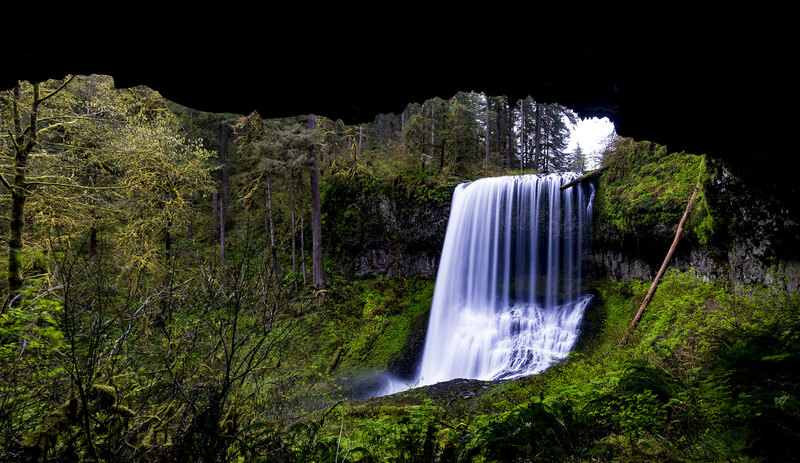 I used a 16mm lens on a full frame camera to capture the falls and used the cave ceiling to frame it. 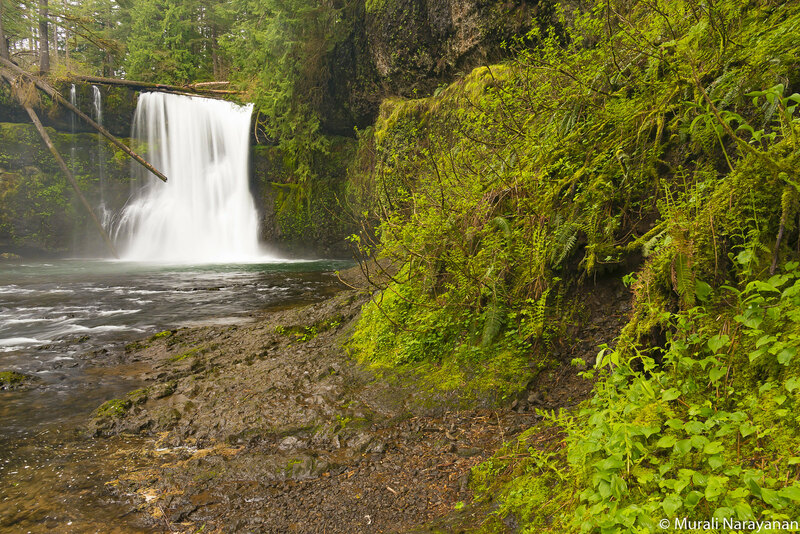 I shot the image below from the main trail (Canyon trail) about 700 feet past the spur leading to the falls. Walking along the Canyon Trail, we came to Drake Falls. I didn’t find anything compelling to shoot. About 0.25 miles past it, a spur on the right led to the Double falls. It started raining again and I quickly grabbed a shot of it with the Nikon D7100. 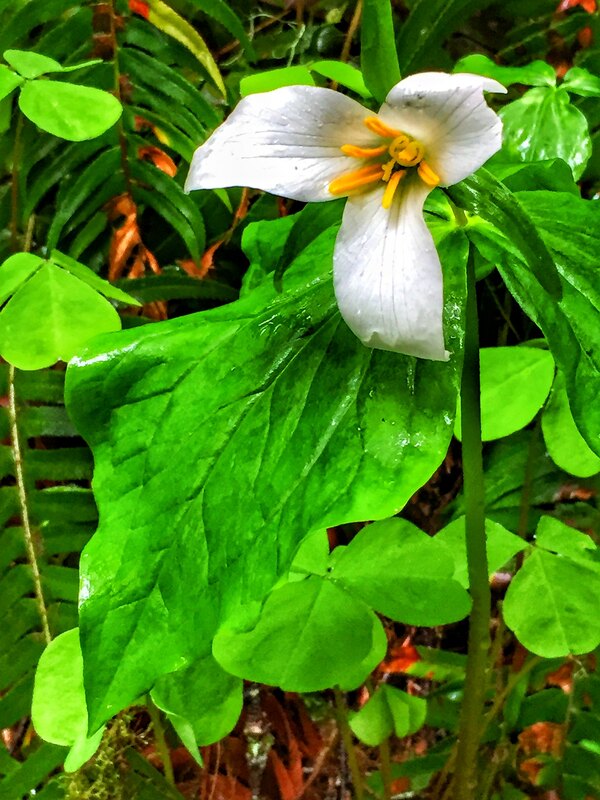 Along the way, we encountered a bunch of white trillium flowers and we grabbed a few shots with our iPhones. 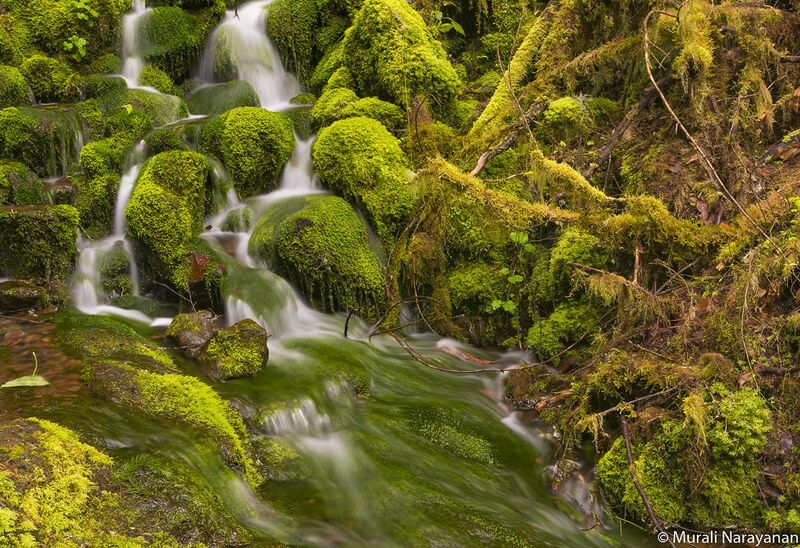 On our way back to the car, we came across a small stream with moss on the rocks. 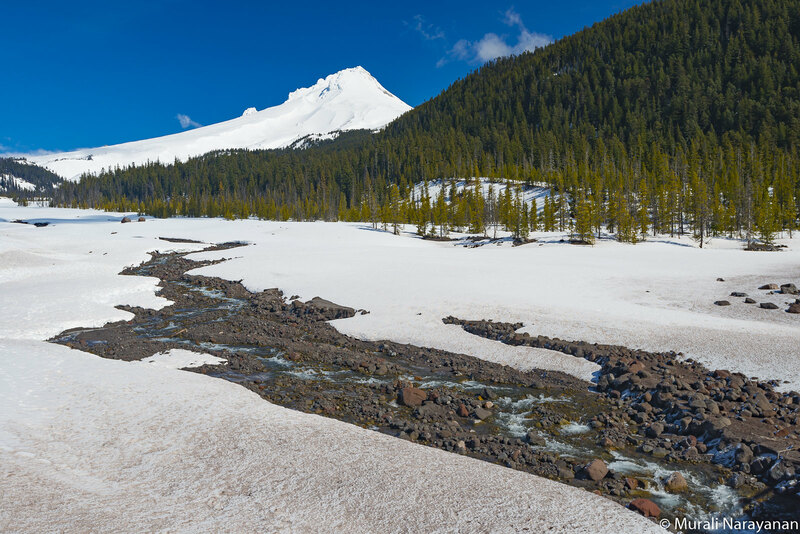 While Larry was checking out the white trillium flowers, I grabbed a few shots of the stream. It was close to 11 and we decided to head back home. 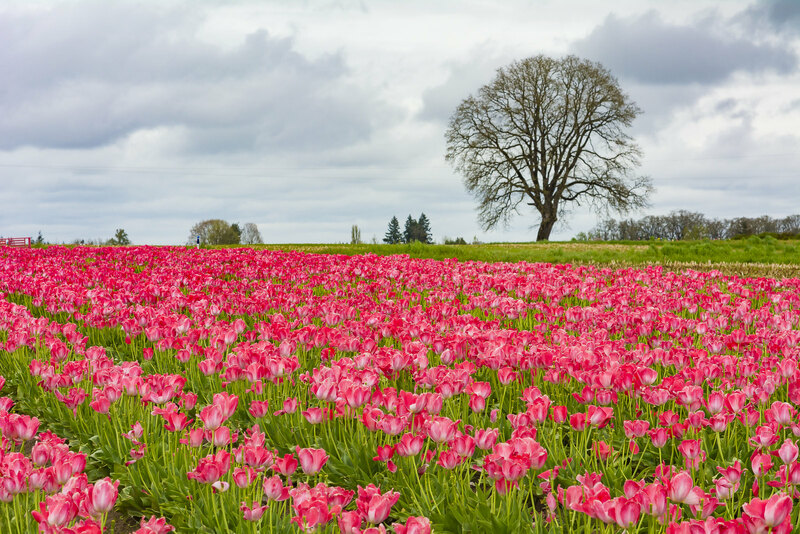 On the way, we stopped at the Wooden Shoe Tulip Farm in the town of Woodburn, OR. The place was a zoo. I estimate there were over 200 cars parked in the parking lot and at least 500 people were roaming around the tulip fields. Photographing the tulips without any humans in the frame was quite a challenge. After 30 minutes of walking around, got a window of a few seconds to get a shot. We returned to Redmond after spending about 90 minutes at the tulip farm.